These reactors use a more open flow design over the phosphate and carbon reactors. Using larger inlet and outlet hosetails, and the use of large media trays. Designed for free-standing in cabinet or sump. Comes Complete with Control Valve. Comes with PVC Unions for 360o hose fitting, for ease of fitting and dismantling of pipework. Pump Requirement: 1500lph - 2500lph. Max Capacity: 1600mls of media. Base the Bio Pellets at 500mls per 100gals/ 440l. Height: 600mm Base footprint: 130 x 130 mm Column Dia: 90mm. 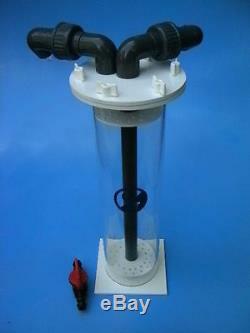 The item "NP350 Bio Pellet Reactor (1500l). For Phosphate and Nitrate" is in sale since Saturday, April 30, 2011. This item is in the category "Pet Supplies\Fish & Aquarium\Filters". The seller is "bosshogthemasterpig" and is located in Sleaford. This item can be shipped worldwide.